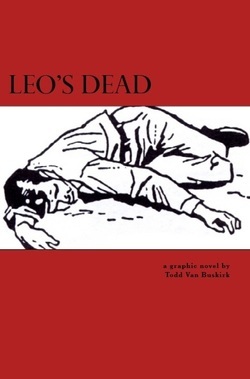 Leo's Dead - Todd Van Buskirk. Artist. There is a man who has died. His name is Leo. This is all we know for the moment. Todd Van Buskirk’s journey into conceptual art began with reading comics as a kid. A keen memory from Todd Van Buskirk’s childhood is that of being intrigued by a Garfield comic strip, by Jim Davis. On this strip, 2 or 3 panels were repeated—the same drawing—over and over. The next time Van Buskirk noticed this effect was in Frank Miller’s work for Marvel Comics and in Miller’s graphic novel, “Ronin.” A couple years later, while working at the Rochester Public Library, Van Buskirk accidently came across David Lynch’s “The Angriest Dog in the World.” This strip uses the same drawing in each panel, the difference being the drawing in the final panel and the changing dialogue. As Van Buskirk expanded his knowledge of art history over a period of twenty years, including a Bachelor’s in animation graphics, he relished the element of repetition within abstract expressionism, color field painting, pop art and minimalism to name a few. The element of repetition was the one element of art he was most interested in. In his third graphic novel Van Buskirk continues to be interested in repetition, a process also explored in many of his prose novels, such as “A world where the sun is eternally locked in an eternal sunset” and his first two graphic novels. Van Buskirk calls this type of literature his “color field” writing. Van Buskirk attempts the same with the comic book, such as the sequenced comic book offered here for your consideration. 1. No original art allowed. In place of original art, find a clip-art drawing. 2. Only one image is allowed in the whole graphic novel. 3. Space (negative and positive) is an element that can be changed or modified. 4. The panel itself can be modified, either through different placement of each panel, or the ability to modify the panel itself. 5. Only four page designs are allowed. This means there will be numerous repetitions of each page in order to have enough pages for a complete graphic novel. 6. The title, copyright content, and name of author is the only text allowed to hint at a textual narrative.